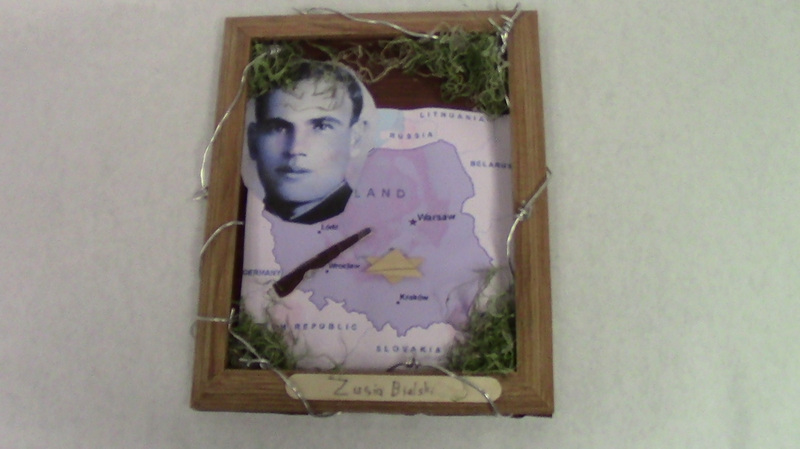 This shadow box explains the life of Zusia Bielski. There is barbed wire around the box to represent the pain and struggle he went through in his life. There is green material in the corners, because he hid in the forest to live out the war. He would go into bunkers and killed Nazis to rescue prisoners in concentration camps. That is why there is a gun in the shadow box. He was Jewish so there is a Star of David. He was born in Poland, which is why there is a map of Poland in the box. It was June of 1941. SS troops were invading Poland. Alexander Zeisal Bielski, along with his brothers, woke up to the sound of gunfire. He looked out his window and saw smoke and fire rising from neighboring buildings. Down below, he could see people running everywhere. It was pandemonium. Everyone was looking for a place to hide. Every person was trying to find a place where they could be safe. People would crawl into holes in the ground, just to avoid the bullets. The Bielski family was a family of millers, farmers, and entrepreneurs. Alexander, who was also known as Zusia, Tuvia, and Asael lost their brother, and their parents to the SS Army. When the SS marched into their town of Stankiewicze, they raided the houses and beat or shot anyone who got in their way. The three brothers escaped into the forest and evaded the Nazis. The SS Army turned their hometown into a ghetto once the brothers left. All of their neighbors got sent to concentration camps and were killed there. The rest of his life, he spent his time doing everything he could against the Nazi Party. He and his brothers saved over 1,200 people from different concentration camps. They lived in the forest, and stole their food and other supplies by sneaking into bunkers and killing any of the officers that they could. Later Zusia joined the Red Army, and actually fought against the Nazis. He was born son of David and Beila Bielski. He was born October 19, 1912 in the city of Stankiewicze. After the invasion of his town, and after he went into the forest, he married his first wife, Cyrl Borowski. He soon lost his wife, and unnamed infant daughter. This was because a group of SS troops attacked his Partisan group of refugees, while he was away with the Red Army. One of the people he rescued with his brothers was Sonia Boldo, who he later married. After the war he lived in Israel for a little while, but soon moved to Brooklyn. With Sonia he had three children, David, Jay, and Zvi. Once in New York, he ran a taxi and trucking business with his brother, Tuvia. He died of cardiac arrest in Brooklyn at age 82. The life that he lived was very hard. Every day he risked his life to save people. Whether that is taking them away from the Nazis, or stealing from the Nazis to get them food and clean water. Most of his life is not known, because he lived in the forest for most of World War Two. A movie has been made that told about his, and his brother’s struggles. He is a hero of World War Two. More people should know about his legacy.